Orange Bus has strengthened its senior management with the appointment of a chief commercial officer. The Newcastle digital agency - which was acquired by technology company G2G3, part of Capita, for an undisclosed sum last year - has hired James Hall following a period of significant expansion which has seen the firm grow revenues to more than £9.5m. Hall has spent the last four years at energy services company ENGIE, where he led an international team developing smart digital solutions designed to improve the lives of local communities. In his new role at Orange Bus, he will be responsible for revenue growth across the business and the strategic development of new accounts. Hall said: “I’m thrilled to join one of the region’s most progressive digital agencies - Orange Bus has a reputation for understanding clients’ complex problems and solving these by applying digital thinking and its knowledge of cutting-edge technologies to deliver tangible transformations. 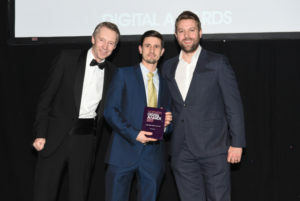 Orange Bus, which was ranked 17th in the Prolific North Top 50 Digital Agencies and also picked up the Large Agency award at the Northern Digital Awards, said it was looking to expand its 100-strong team and grow revenues to around £12m by the end of next year. It works with clients including HMRC, Joules, Pearson, Argon and the NHS.